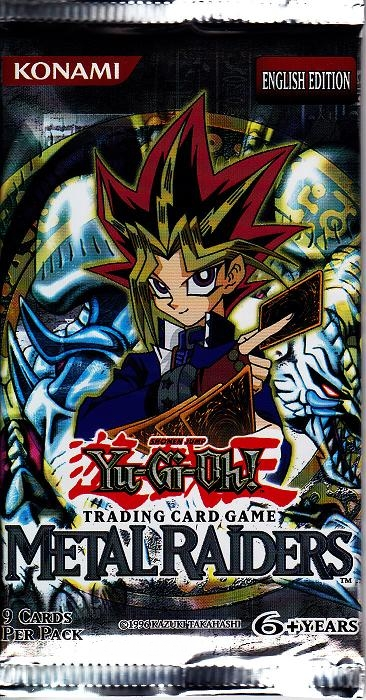 For those interested in legacy format, it’s worth knowing that the 2nd booster set Metal Raiders (released in July 2002) significantly changed the meta which existed in May 2002 with only a card pool of Legend of Blue-Eyes and Starter Deck Yugi/Kaiba. 1) Decks carrying two Heavy Storms means you must set spells/traps more conservatively. but 3 or more leaves you open to lose out on serious card advantage. In LOB format, players could set as many spells/traps as they wanted without fear, and it was even encouraged. There was no strong spell/trap removal then. But now setting more than 1-2 spells/traps leaves you open to being punished. This is also a nerf to Swords of Revealing Light, which is not a bad card at this point, but is no longer a staple either. 2) Sangan and Witch of the Black Forest, each allowed at 2, cheapen the value of removal. Since they replace themselves, using removal on them is disadvantageous. This is a significant change from the LOB meta in which removal was almost always good. Sangan and Witch make Trap Hole a less reliable card to set and can be added to the field alongside a monster with better stats to act as a Fissure-magnet. Dark Hole, Raigeki (and Change of Heart for Tributing) used to be a reliable out for set monsters, but now if the set monster they’re used on happens to be Witch or Sangan, utility is lost. 3) Flip Effects like Magician of Faith and Mask of Darkness add spell/trap recovery to the game. In LOB format, a player could count what cards the opponent has left in deck and know that once the cards are used up, they won’t be a threat again. But now a player must be prepared for a 2nd Raigeki. 4) LV4 Beaters get a few more options but are still less essential than before. 7 Colored Fish is a new LV4 1800 ATK option alongside La Jinn, but this effectively pushes out 1700 ATK beaters like Battle Ox and Neo the Magic Swordsman. Mirror Force is also added punishment to discourage players from swarming with beat sticks. Yes, high 2000+ ATK monsters like Dark Elf and Jurai Gumo exist, but their life point costs are high and while they counter LV4 beaters, LV4 beaters aren’t as good as they used to be. 5) Robbin’ Goblin impedes the flow of the game. While not realized at the time, legacy formats in recent times have shown that using a deck with 3 Robbin’ Goblin and various high DEF LV4 monsters is a nasty tactic. As a result, beaters like La Jinn don’t want to attack into set monsters because it would just result in losing a card and gaining absolutely nothing from the interaction. 6) Defense monsters rule the meta. Consider the points made above. Beaters aren’t as great. Very little removal for set monsters exists and the ones that do could just be fruitlessly wasted on Witch or Sangan. Players are afraid to attack sets because of Robbin Goblin. But if they don’t attack a set monster, the opponent could Flip Effects and freely tribute them for Summoned Skull. If there was ever a meta that needed Nobleman of Crossout, this would be it. However, it is also true that defense monsters being less predictable results in more mind games and cerebral play on guessing which of the 3 (wall, flip effect or Witch/Sangan) the opponent is setting. Other notable cards not mentioned above that Metal Raiders added: Thunder Dragon, Solemn Judgment, Magic Jammer, Horn of Heaven, Seven Tools of the Bandit, Stim Pack, Tribute to the Doomed.